Updated to here! ------------------------------ PMs for users with MONTH birthdays have been sent. ------------------------------ Dirtytabs, your 7 gifts have been added. WWECornSerpent, your 8 gifts have been added. Thank you for gifting! Gealach, your 2 gifts have been added. Thank you for gifting! rrattts, your 2 gifts have been added. Thank you for gifting! Tecca, your 2 gifts have been added. Thank you for gifting! banban007, your gift has been added. Thank you for gifting! Terces, your 4 gifts have been added. Thank you for gifting! Syryn, your 6 gifts have been added. Thank you for gifting! Ellenai, your 4 gifts have been added. Thank you for gifting! Natevaelle, your 7 gifts have been added. Thank you for gifting! Ruby Eyes, your gift has been added. Thank you for gifting! IOU, your wishlist has been added. Happy early birthday! IOU, your gift has been added. Thank you for gifting! nxtashaxt, your gifts have been added. Thank you for gifting! ------------------------------ Additional December birthdays oddsoxdi 12th PM CB pyro xenowyrm 3G even-gen. chrono/thalassa xenowyrm checker 3G even-gen. chrono/gaia xenowyrm checker Nice even-gen. checkers IOU 17th PMCB Gold CB or PBEG Tan Ridgewing (by PB I mean actually only having tan in family line) Anything born on my birthday, caught or bred doesn't matter Well just wish me good luck in holiday catchings Surprise me! Updated to here! ------------------------------ PMs for users with December birthdays have been sent. ------------------------------ Dirtytabs, your 5 gifts have been added. Terces, your 9 gifts have been added. Thank you for gifting! WWECornSerpent, your 5 gifts have been added. Thank you for gifting! DaniBoo, your wishlist has been added. Happy early birthday! Ellenai, your gift has been added. Thank you for gifting! vi_obsession, your wishlist has been denied. Please reread the rules and resubmit. Ellenai, your wishlist has been denied. Please reread the rules and resubmit. Dirtytabs, your wishlist has been updated. Updated to here! ------------------------------ Natevaelle, your 3 gifts have been added. Thank you for gifting! Munificent, your 3 gifts have been added. Thank you for gifting! FAstudent12, your 5 gifts have been added. Thank you for gifting! Dirtytabs, your 3 gifts have been added. Thank you for gifting! Terces, your 2 gifts have been added. Thank you for gifting! Ellenai, your 3 gifts have been added. Thank you for gifting! WWECornSerpent, your 6 gifts have been added. Thank you for gifting! Syryn, your 2 gifts have been added. Thank you for gifting! Echithan11, your wishlist has been added. Happy early birthday! Gealach, your 3 gifts have been added. Thank you for gifting! HopeUnbroken, your wishlist has been added. Happy early birthday! ------------------------------ Additional November birthdays Echithan11 18th PM CB Gold CB Red Dorsal 4G+ Silver Any Metals fitting this category Any extra hatchings you want to give HopeUnbroken 28th PMAny CB Metal CB Xenowyrm PB EG Golden Wyvern PB EG Two-Headed Lindwurm Any PB EG Hatchling Surprise me! Updated to here! ------------------------------ Gealach, your 6 gifts have been added. Thank you for gifting! Dirtytabs, your 3 gifts have been added. Thank you for gifting! Dusky_Flareon, your wishlist has been updated. Happy early birthday! Natevaelle, your gift has been added. Thank you for gifting! lovecats99, your gift has been added. Thank you for gifting! kreepers_killer, your wishlist has been updated. Happy early birthday! Syryn, your 5 gifts have been added. Thank you for gifting! Jedi40, your wishlist has been updated. Happy early birthday! WWECornSerpent (and Sunstar23, EndermanCreeper), your 10 gifts have been added. Thank you for gifting! yipyipbrrring, your wishlist has been added. Happy early birthday! Terrafreaky, your gift has been added. Thank you for gifting! Updated to here! ------------------------------ PMs for users with November birthdays have been sent. ------------------------------ Terces, your 6 gifts have been added. Thank you for gifting! FAstudent12, your 8 gifts have been added. Thank you for gifting! Natevaelle, your gift has been added. Thank you for gifting! Ellenai, your 3 gifts have been added. Thank you for gifting! Gealach, your 2 gifts have been added. Thank you for gifting! WWECornSerpent, your 3 gifts have been added. Thank you for gifting! Mashabely, your wishlist has been added. Happy early birthday! Dirtytabs, your 2 gifts have been added. banban007, your gift has been added. Thank you for gifting! BananaGummyBear64, your wishlist has been updated. Happy early birthday! Natevaelle, your wishlist has been updated. Happy early birthday! Updated to here! ------------------------ Natevaelle, your gift has been added. Thank you for gifting! Gealach, your 3 gifts have been added. Thank you for gifting! FAstudent12, your 7 gifts have been added. Thank you for gifting! rrattts, your gift has been added. Thank you for gifting! banban007, your gifts have been added. Thank you for gifting! alphadaykeeper, your wishlist has been added. Happy early birthday! WWECornSerpent, your 4 gifts have been added. Thank you for gifting! aisudesu, your wishlist has been added. Happy early birthday! Ellenai, your gift has been added. Thank you for gifting! aisudesu, your gift has been added. Thank you for gifting! artiuslove, your wishlist has been added. Happy early birthday! Terces, your gift has been added. Thank you for gifting! -------------- Additional October birthdays artiuslove 20th PM 2nd gen Hollykin or prizekin (ultimate wish) 3EG checker offspring from Spriter's alt 3rd gen Hellfire from Black Marrow(M) checker, mate for this CB aeon hatchling CB xenowyrm hatchling surprise me? I like pretty checkers. Especially with holidays alphadaykeeper 24th PMneglected 3g from spriter's Alts I really am not picky about these! Updated to here! ------------------------ PMs for users with October birthdays have been sent. ------------------------ WWECornSerpent, your 2 gifts have been added. Thank you for gifting! FAstudent12, your 3 gifts have been added. Thank you for gifting! Blueocean, your gift has been added. Thank you for gifting! Ellenai, your 3 gifts have been added. Thank you for gifting! munificent, your 2 gifts have been added. Thank you for gifting! Syryn, your gift has been added. Thank you for gifting! Dirtytabs, your 3 gifts have been added. Cheekadee, your wishlist has been added. Happy early birthday! Terces, your gift has been added. Thank you for gifting! Terrafreaky, your gift has been added. Thank you for gifting! banban007, your gift has been added. Thank you for gifting! Updated to here! ------------------------ rrattts, your gift has been added. Thank you for gifting! banban007, your 3 gifts have been added. Thank you for gifting! Ponystar17, your gift has been added. Thank you for gifting! Viridis, your gift has been added. Thank you for gifting! Terces, your 6 gifts have been added. Thank you for gifting! Gealach, your 3 gifts have been added. Thank you for gifting! Jedi40, your gift has been added. Thank you for gifting! CuriousCake, your wishlist has been added. Happy early birthday! WWECornSerpent, your 6 gifts have been added. Thank you for gifting! Diame, your wishlist has been added. Happy early birthday! ladymatch, your gift has been added. Thank you for gifting! Dirtytabs, your 5 gifts have been added. munificent, your gift has been added. Thank you for gifting! Meg_752, your gift has been added. Thank you for gifting! FAstudent12, your 6 gifts have been added. Thank you for gifting! sheppardkid, your gift has been added. Thank you for gifting! Updated to here! ------------------------ For now, all breeds from the new release are common enough to remain off the higher tiers. If that changes in the future, their/its placement will be announced. Also, CB xenowyrms have been placed on Tier 2. For a long time, they've been left off, but they seem to trade at the level of unbreedables and trio dragons. If you have any questions, please PM this account or Dirtytabs. ------------------------ Terces, your wishlist has been updated. Happy early birthday! Digipup, your wishlist has been updated. Happy early birthday! Dalek Raptor / Raptor of Dragons, your wishlist has been added. Happy early/verybelated birthday! Meg_752, your wishlist has been updated. Happy early birthday! Syryn, your wishlist has been updated. Happy early birthday! Syryn, your gift has been added. Thank you for gifting! -------------- September birthdays iSammiSam 1st PM CB Gold Gilded Bloodscales (hoarding so clean lineages of any gen will be nice. :3 especially PBs) Terces 4th PM2nd gen Gold or Silver from Flamingo 3rd gen checker from Spriter's Alt Any gen Metal checker Flamingo hatchling Anything else from my wishlist rrattts 6th PM2nd gen gold (see profile) 2nd gen alts 2nd gen PB undine CB Imperial Fleshcrownes 2nd gen hybrids Surprise me! Digipup 7th PMCB gold (needs to be female) Purple Dino FAstudent12 17th PM2nd gen prize (Would really like a silver tinsel, especially from nebula, celestial or antarean.) 3rd gen silver from male white, not related to https://dragcave.net/lineage/1quic 3rd gen Undine checker from female Ice Any Checkers with Nebula/Antarean/Celestial together CB Nebula Anything else listed in the wish list in my signature PonyStar17 17th PMCB Green Copper (preferably influence-able egg or female hatchie) Alt black Anything from my mate wishlist in profile Anything with a spriter's alt in lineage Red hatchling Any hatchling from my freezing list in profile that you're okay with freezing xHaiki 18th PMNeglected Blue Dino Surprise hatchling or egg! Surprise CB hatchling or egg! Surprise me! (check wishlist if you please, link is in my sig~) IlaQuickel 22nd PM Neglected Any dino Any nice thing will do Syryn 22nd PMCB Aeon Any 2nd gen Prize-Kin not on my list in my profile Any 2nd gen from Holiday on my Mates Needed list in my profile Any CB Egg/Hatchie on my Wish List in my profile Surprise me! Updated to here! ------------------------ PMs for users with September birthdays have been sent. ------------------------ FAstudent12, your wishlist has been updated. Happy early birthday! Dirtytabs, your gift has been added. Updated to here! ------------------------ jesterboohoo, your wishlist has been added. Happy early (or very late) birthday! Syryn, your 2 gifts have been added. Thank you for gifting! FAstudent12, your 7 gifts have been added. Thank you for gifting! Dirtytabs, your 3 gifts have been added. banban007, your 2 gifts have been added. Thank you for gifting! diablokitty, your wishlist has been added. Happy early birthday! Terrafreaky, your gift has been added. Thank you for gifting! xHaiki, your wishlist has been added. Happy early birthday! Updated to here! ------------------------ Gealach, your 5 gifts have been added. Thank you for gifting! Natayah, your 9 gifts have been added. Thank you for gifting! Dirtytabs, your 3 gifts have been added. DevilAngelWolf27, your gift has been added. Thank you for gifting! webcowgirl, your gift has been added. Thank you for gifting! WWECornSerpent, your 8 gifts have been added. Thank you for gifting! munificent, your gift has been added. Thank you for gifting! Hellovampire, your wishlist has been added. Happy early birthday! Terrafreaky, your 2 gifts have been added. Thank you for gifting! FAstudent12, your wishlist has been updated. Happy early birthday! SockPuppet Strangler, your 2 gifts have been added. Thank you for gifting! FAstudent12, your gift has been added. Thank you for gifting! Occasionally Asked Questions Questions about Donating Are there any requirements to be a donor? Nope! Anyone can gift. Can I breed/donate more than one gift for the same person? Of course! Can I breed/donate anonymously? Of course! Just message this account or a mod with a link to the gift with the name of the recipient, and I will make sure the person gets it. Can I send gifts to someone after the month of their birthday has passed? Yes. Most often this occurs because dragons have been uncooperative, or a user signed up right before their month ended. You are free to send belated gifts, though try to keep the time frame reasonable. You just updated the thread and I just now discovered my gift had been accepted. How do I notify you of this change from offered --> accepted? Please send a message or post a note in the thread. I'll make the appropriate updates the next time I run an update. A user has not taken my gift after >24 hours. Some donors are kind enough to send a reminder message to the recipient, but you are not required to do so. If you're still holding a gift longer than 24 hours, please mention it on your gift report ("No response..."), and you may also message this account. The recipient will be warned and their list possibly removed from the main list depending on how/if they respond. Things like this happen sometimes, usually by accident - I hope it doesn't spoil your gifting experience. What does it mean when an update says my gift has/gifts have been "added"? It means your gift has been added to a secret spreadsheet. There's no points list on this thread, but if you'd like to know how many gifts you've given, PM and you'll get a number! Questions about Receiving Gifts How do you decide what breed goes in what tier? Tier items are decided by their rarity or how difficult they are to acquire. If a recent release seems rare enough to go on tier 1 or 2, I will announce that in an update. Because "rarity" isn't always easy to determine (and availability of some breeds changes over time), please message this account or mention on the thread if you think something should be moved or added to a tier. Can I accept more than one gift? Yes you can. Can I sign up several months before my birthday? You can sign up whenever you want. Just make sure you respond to the activity check PM so you don't get removed when your birthday comes around! Can I sign up the month of my birthday? Of course! Can I request an egg to be bred or caught on my birthday? Of course! Will I get the gift on my actual birthday? Donors are in charge of when you'll get your birthday gift. It may be on your actual day, within that week, or within the month. It all depends on how easy it is to get your gift. You may request for something to be bred/hatched/caught on your birthday if you'd like. May I freeze a gift? This is up to the donors. If you plan to freeze a hatchling, it would be nice to note it in that entry that'd you'd like something to freeze. If someone offers me a gift that isn’t what I asked for, can I reject it? You are expected to take gifts you are offered, and I believe donors wouldn't send things to you in bad faith. However, if this is due to a mod mistake, such as an incorrect list being published, you do not have to take if if you really want it to go to the correct recipient. I will message you and your donor if I've made that error to resolve it. If I need to be offline for a few days during the month of my birthday, can I still receive gifts? Absolutely, but please say that you'll need to be offline and provide the dates. When your month comes along, there will be a note by your list about away dates. I will try to pay attention to signatures, too, but as long as it's announced somewhere, you're fine. What happens when I receive a warning for not accepting a gift in time? 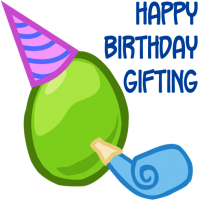 If you don't take a gift within the allotted time (24 hours, though some donors are willing to wait longer), you will receive a personal message from the Birthday Gifting account, and your list will be removed from the main list. While we understand that sometimes accidents happen or you need to be away for some time, it's not fair to our donors to make them hold things. If you received such a warning but wish to be added back, simply respond to the PM (and it would be nice if you PM the other user to sort things out as well). Please pay attention to your inbox. If you receive a second warning for the same infraction, your list will not be added back. I signed up and didn't receive anything! That might be because your list is too difficult (only asking for CB golds and 2nd-gen. prizes for instance) or you signed up right before your month has passed. The donors here are the backbone of Birthday Gifting, and sometimes they just can't fulfill a request. It's unfortunate, but it does happen. How do I remove myself from the Birthday Gifting list? If you would like to be removed, please message this account or a mod or post on the thread. If it's currently not your birthday month, you may ignore the next check-in message from Birthday Gifting. I was looking at the spreadsheet and I noticed my name and row are highlighted. What does it mean? Green means you have responded to the activity check, or if you just signed up, you've followed all the rules. All is good to go and you will be added the month of your birthday to the main list on the front page. YAY! Red means your list does not meet our requirements in some way. Failing to update it will result in your list not being published the month of your birthday. Grey means you have not responded to the activity check or do not seem to be active any more. (Grey entries will be cleared out a year after they've been marked.) Questions about the Thread How often is the thread updated? I will try to update it at least once every few weeks, although I visit the thread often without updating. I have a complaint/concern/suggestion. What do I do? Message the account or a mod. What's the quickest way to contact the mod of this thread? Message the account or a mod. I check the thread, too. Unanswered questions? Message the account or a mod! White List WWECornSerpent for donating so many gifts. Thank you for being so generous! Gray List (you've been warned) None! Black List (do not donate/gift to these people) None!